Life is getting busier, but still, your car needs to look good so that you can hit the driveway with total confidence. Actually, there is nothing as good as being behind the wheel of a car that steals the show in town. ​But if you don’t take care, your car's exterior will gradually lose that glossy shine. This means you need to add buffing to your car maintenance to maintain its overall allure, lengthen its life and keep it as beautiful as long as you own it. Why You Need The Best Polisher For Car? It delivers a perfect, faster and glossier finish that you can never get by hand: You will agree with me that hand buffing to clear water marks, stains and scuffle of your car is a time-consuming exercise. Besides you need to work very hard to get the desired results. Consequently, machine buffing is faster, fun and delivers a glossier paint work than your hand can ever deliver. It prepress your paint work for the ultimate finish: The ultimate key to the ultimate finish is to have proper preparations. A quality car buffer prepares your paintwork by working out any imperfections on your car surface this ensures that you will have a reflective shine when you apply the polish. It protects your car from rust and other elemental damage: If you thought having a great aesthetic is the only thing that matters, you are wrong because there is more above that glossier finish. Let me tell you if your car surface has any imperfections, water can collect in the swirls and cause faster deterioration. Buffing out the swirls creates a new layer of protection and this helps extend the life of your paintwork. Investing in a quality car buffer is always rewarding as far as paintwork is concerned. However, getting the best unit is never easy considering the numerous number of different options available. Because they are engineered to accomplish different tasks, they come with unique features making it very hard to distinguish between qualities, reliable polisher from a dummy that is there only to fetch money. ​Functionality: There are renowned companies like DEWALT and Bosch that are trusted to produce quality car polishers. It is good to purchase from a trusted company but it is wiser to carefully compare the options to make sure you are investing in the right product. For instance, an auto shutoff feature that prevents you from damaging surfaces because the brushes are worn down is invaluable. Make sure that all the features on the buffer are useful. ​Compounds: Many people tend to ignore this factor but for sure the choice of compounds is critical to a successful project. You need to choose the compounds depending on the condition of your car. For instance, if your car is black you can’t use the same compounds you would use on a green car. To put it differently, a car that is cleaned and waxed regularly will use different compounds from one that has never been polished. ​Warranty: Considering the adverse conditions you are going to use the buffer in, it is important for it to be backed by a long lasting warranty. This will guarantee you that should your tool malfunction within the warranty period, you can return it to the manufacturer for a replacement, free service or refund. 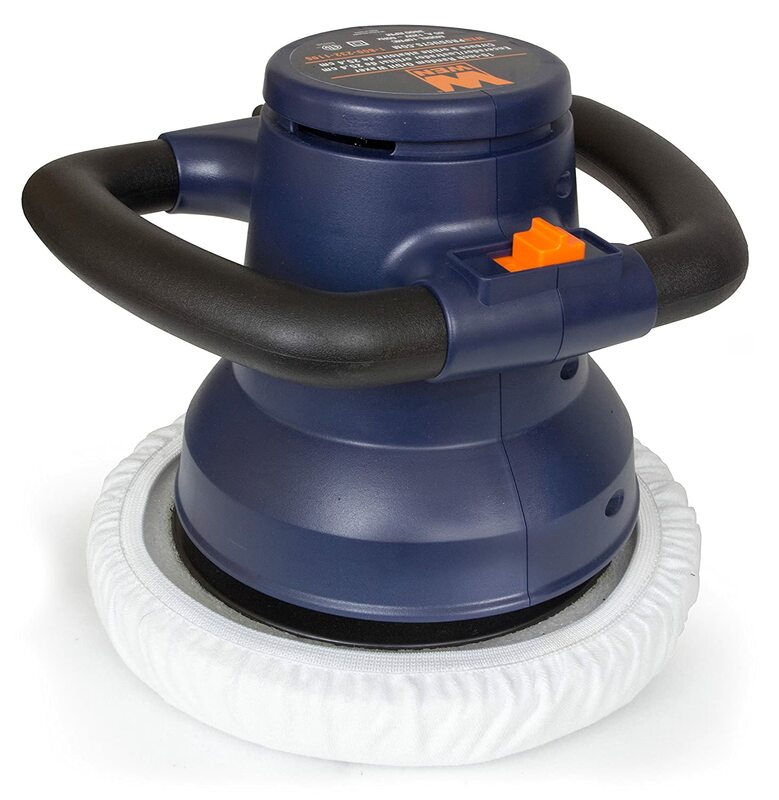 BLACK & DECKER WP900 6-INCH RANDOM ORBIT WAXER/POLISHER. 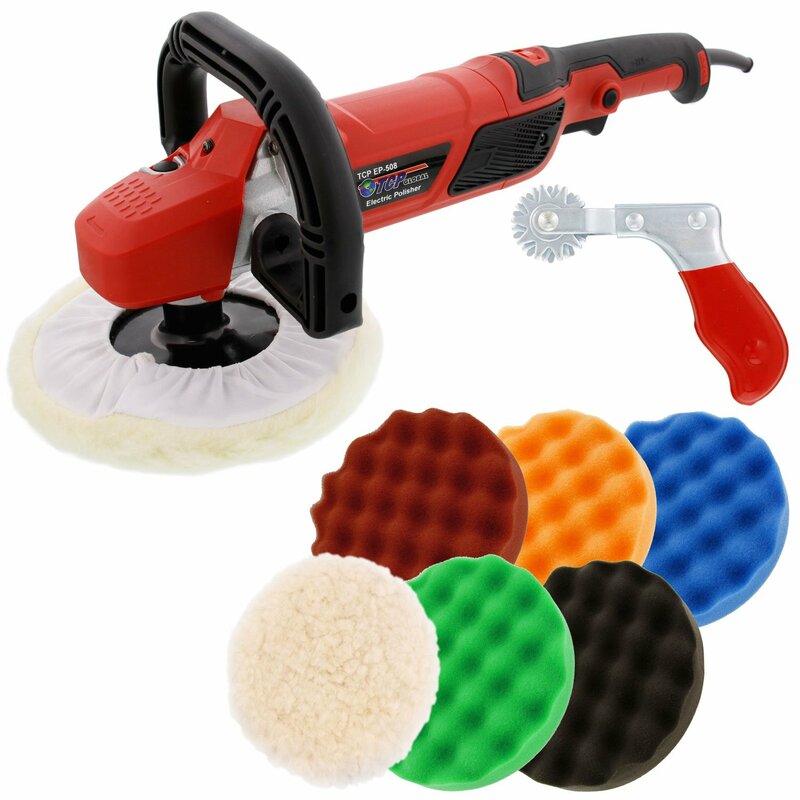 This WEN 10PMC 10” polisher features dual handle grips increase accuracy and control in any paint job. Besides, this car polisher is very versatile and can be put into different uses so even if you don’t have a car, this Waxer works great in the bathroom, countertops, and banisters polishing. The advantage of this Waxer is that it is durable, powerful enough for any blemish and most importantly affordable. That’s not all as it also comes with 2 applicator bonnets, 2 polishing bonnets, 2 wool blending bonnets and 1 washing mitt this means you will have it for some time before needing to buy more. It is powerful enough to remove stains or blemishes. It features dual handle grips for increased accuracy and control. It is versatile and for other types of surfaces. It is quiet, efficient and well designed. 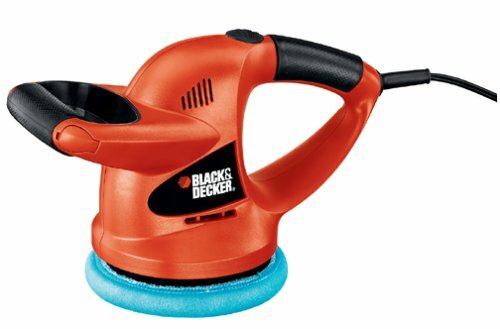 The Black and Decker car polisher is well made to give your car that clean and shiny look so you can hit the driveway confidently. The first thing you will see once you unbox this kit is the wonderful 10 ft. cord, this means you can still polish your car using this kit even if you don’t have an extension cable. Still on design, the Black and Decker Waxer has dual handles which makes it easy to hold it while buffing your car. It runs on a random orbit at 4,400 orbits per minute which give a fast, smooth and swirl—free finish. In the box, you will find 1 foam applicator bonnet and 2 polishing bonnets. This corded electric car buffer is certified to be frustration free and perhaps this is the reason it is backed by a 2-year warranty. It is strong and very powerful. It has a long cord for easy movement. It is less than $30, much cheaper than its competitors. It has two handles for a comfortable and secure grip. It has no variable speeds. By weighing the pros and cons of these two car buffers, it is evident that they all have great features needed to make your car the talk of the town. While the WEN 10 PMC buffer packs more accessories, it is a bit pricier than the Black and Decker. The Black Decker is not only budget friendly it is more powerful and faster. As for their warranties, the Blacker and Decker give more peace of mind as it is backed by a solid 2-year warranty while the WENN 10PMC warranty is just for 1 year. As for me, the Black and Decker is my favorite buffer. This PORTER-Cable buffer stands out as one of the most powerful version. It also boasts of unique characteristics that are not only unmatched but also more expensive to acquire. First, it prides itself for the spiral level gear drive together with the 4.5 amp motor, this combination gives it a faster removal rate to clean out swirls, water spots, stains and even oxidation without burning the paint. Uniquely, this polisher accepts 5/16 to 24 spindle thread accessories. This review couldn’t be complete without talking about what you will first set your eyes on after unboxing it. Other than this tool, you will also see, a swirl-free sanding, removable 2-position handle, wrench, operating instructions and a 6-inch polishing pad. As a beginner, I liked the operating instructions which helped me use this tool efficiently. 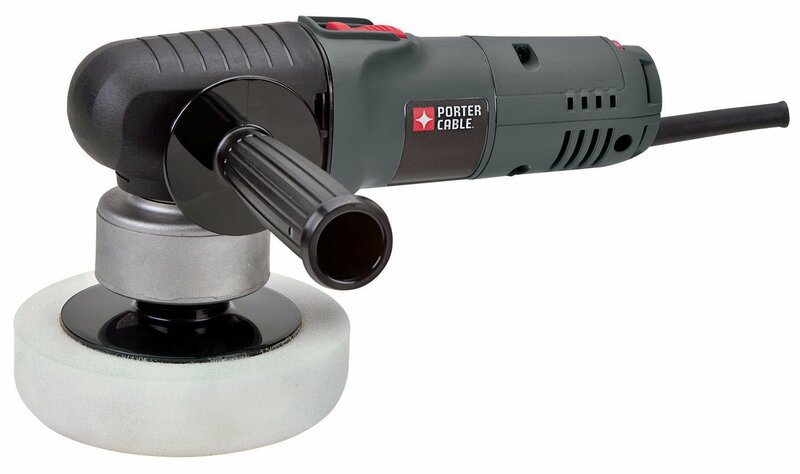 Finally but not the least, the PORTER-CABLE polisher is backed by a 3-year limited warranty which covers any defect that can be blamed on the manufacturer. Together with this, you will also be covered by the PORTERS-CABLES 1-year free service contract. It is well balanced and built for durability. The variable speeds gives you maximum control depending on the nature of the task. Heats up and polishing pad come off easily. Too many vibrations demanding you to wear gloves. If power polishing is all you are looking for, then you may want to look at this amazing tool. This Dewalt polisher runs a 12-amp motor that delivers up to 1,250 watts this means it is best suited for the high demanding tasks. 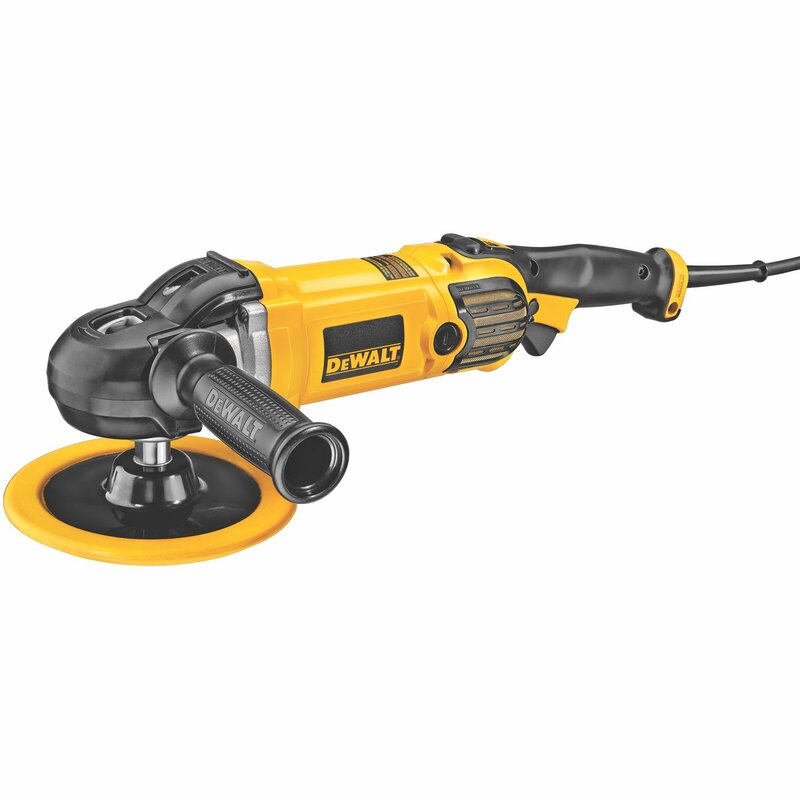 DEWALT variable speed polisher combines power and versatility making it perfect for auto and boat detailing as well as metal finishing. Together with this is a conveniently located 2-finger variable speed trigger which gives you a complete control regardless of the momentum. Also, this DEWALT polisher is equipped with an Exclusive Controlled Finishing System which enhances speed control and finishes quality. This tool is made to last, thanks to the Integrated Wool Ingestion Shields which increases the polisher’s lifespan and still reduce costs associated with servicing and repairs. Given all the cool features, (power, variable speeds, great ergonomics among others) this variable speed car polisher still afford a 90-day money back guarantee but you will hardly return it. In addition, it offers a 1-year free service and 3-year warranty. You are therefore assured that your investment is worthwhile. I liked the included hook and loop backing pad which provides for easy and quick tool-free accessory changes. Interestingly, this polisher is compatible with a variety of hook and loop accessories. Its 12 amp motor maximizes performance. Variable speed control provides for smoother finish and better result. The wool ingestion shields improves the tool life. It operates nice, smooth and most importantly pretty quiet. It very versatile and flexible. It heats up after long periods of use. Makita’s 7-inch electronic polisher is one of the best Waxer among automotive and marine enthusiasts. It combines 10 amp power and variable speed control to deliver a fast and powerful reflective shine. When it comes to comfort and ergonomics, this tool is not left behind. First, it has an ergonomic handle with lock-on trigger switch which is made for continuous use at one speed. On top of this, the loop handle provides a comfortable grip for better control. It also features a soft start which ensures smooth startups, I actually found this electronic polisher very easy to operate. What is more with this Waxer is the 3-prong plug that plays an important safety role to prevent static electricity from accumulating in the tool. Makita is an amazing and versatile polisher that is engineered to take down a range of polishing and sanding applications. 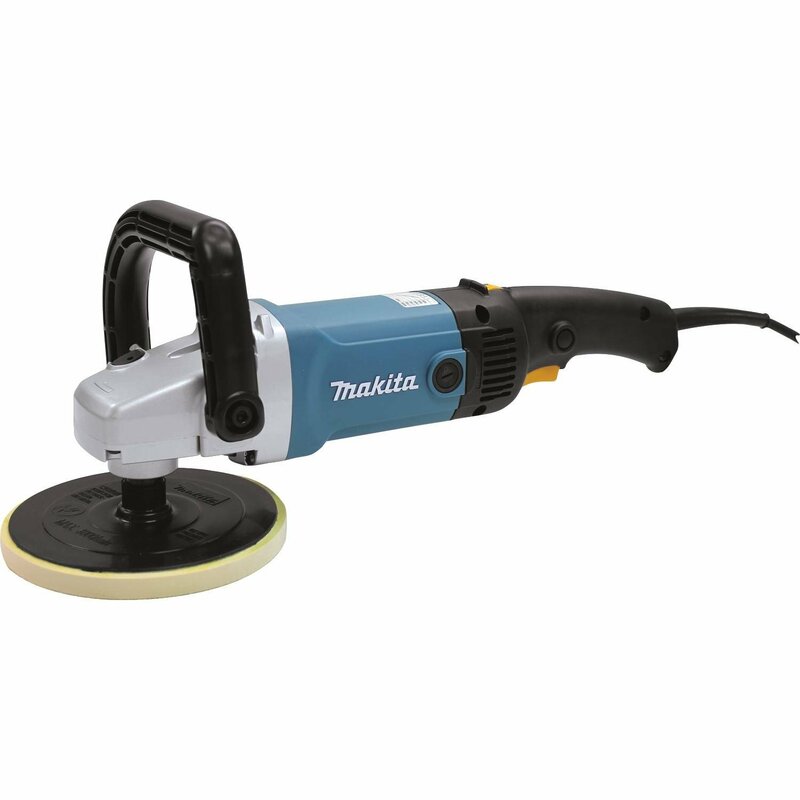 This Makita’s polisher works well in automotive, marine detailing and stone polishing work. Inside the Makita 9227C 7-inch electronic polisher box, you will find a hook-and-loop backup pad, side handle, loop handle and a hex wrench. The 10 amp motor delivers a fast and powerful polish. The variable speed trigger gives better control. The handles are ergonomically designed for a comfortable grip. It comes with a lock-on button for continuous use operation. It is very versatile and can be put into a range of uses. TCP Global 7” stands out as one of the best professional car polishers. This professional high-performance polisher is strong and very powerful. Thanks to the 12 amp motor which give up to 1200 watts of power giving this polisher an incredibly high performance. In addition to this, it has variable speed control of about 1,000 to 3,000 rpm to give you absolute comfort when operating this tool. I liked the fact that I could adjust the polisher’s rpm according to my ideal cutting speed. And the most amazing thing with this polisher is that it is able to maintain high torque levels even at low speeds and that’s why this is one of the best tools for polishing. Comfort and ergonomics are well factored in this professional polisher. It comes with dual handles (a traditional side handle plus an over the top D style handle). That’s not all because it also has a 7” grip backing plate that works well with buffing and polishing pads. Another cool feature of this TCPP professional high-performance polisher is the ability to cut and buff even the most oxidized automotive coatings, color standing scratches and the hardest clear coats. This soft starting professional high-performance polisher allows you to bring out the highest level of car shine. It has an extra set of polisher. The speed control dial allows you to set the ideal polishing speed. Has a very powerful motor for high performance. It delivers a smoother polishing action. It polishes even the hardest clear coats and the most difficult oxidized automotive coatings. The wires going to the relay switch are way short. The look of your car is upon you, take the advantage of the best car polisher to maintain its glossy shine and improve its resale value. Given the points above, it is not easy to find the best product that will give your car paintwork a glossy new shine. Prices and features of the products varied but still had their own benefits. ​After evaluating the top five picks, my heart settled for the Black & Decker WP900 6-Inch Random Orbit Waxer. This polisher is very strong and powerful. As one of the best car polisher, it comes with a long cord which allows you to cover a wide area with ease and most importantly it is budget friendly. But if you are a beginner, you can consider buying PORTER-CABLE 7424XP 6-Inch Variable-Speed Polisher as the operation manual gives a step by step guide on how to use the tool. Therefore, I conclude that it is a good option for beginners in car detailing. To wrap it, I recommend you to do own research and compare and contrast our top picks to find one that fully meets your unique needs. Please share with me what you finally settled for and what is your experience with it.